Traffic has been nice to us and we got southwards quite quickly. 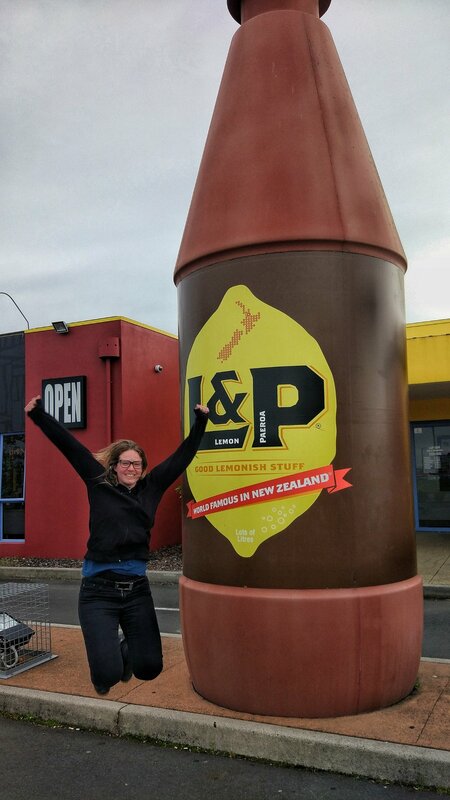 Being a tourist still, of course I needed to stop in Paeroa for a picture in front of the giant L&P bottle (a soft drink world famous in New Zealand). Chris captured me as I (tried to) jump in front of the big bottle. Until an employee of the café came and told us that this is not the bottle we’re looking for, the “real” one was somewhere in a park next to the main street. Oops. A little bit later we stopped for a coffee and brekky (because outside of cities nothing really opens before 9am) and after about 3 hours drive from Auckland to Tauranga, we arrived. It’s the biggest city on the North Island after Auckland and also lies along the water. We paid a visit at the Tauranga i-Site (as you should always do, no matter where in New Zealand you are visiting) and got some very valuable tips on what to do in Tauranga, the Mount (as it’s also called, or Mauao) and the surrounding areas. We decided to go on a walk around the lovely Waikareao Estuary which took us about 2 hours. Afterwards, we drove over to the town of Mount Maunganui beach. It’s only about 5 minutes from Tauranga and has this typical cool surf beach flair. Shops selling surfboards and clothes, colorful bars and fancy restaurants. Mount Maunganui camping ground lies directly at the feet of the Mount and right on the beach. It’s an extremely popular campground in high season for obvious reasons and needs to be pre-booked well in advance during summer. We quickly pitched our tent, so we could go and get some food into us. We found what we were looking for at the Astrolabe Bar. 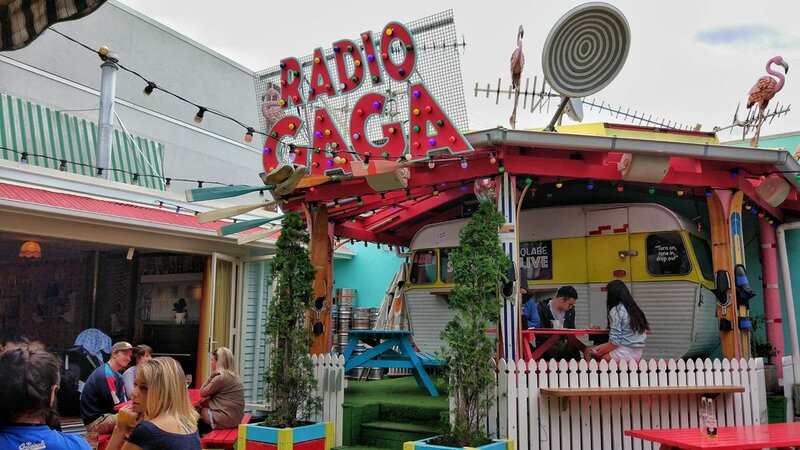 We instantly liked the freaky-colorful interieurs and the food was yummy too. For dinner we went to a place called Osteria Mount Maunganui, a very pretty Italian restaurant with tasty pasta (and other mouth-watering things we saw on our neighbours’ plates). After a quick drink at the Astrolabe bar which had by now turned into a nightlife hotspot, we went back to the campground to sleep. After all, we were still optimistic we’d get up at 4am to climb Mount Maunganui at sunrise, ignoring the fact it was still raining. top of the Mount at sunrise? Yeah nah! At 4am, my alarm went off. I didn’t even have to look outside to check if sunrise was happening today. The sound of rain on our tent said it all. Instead, we slept till 8 instead and after a quick brekkie decided to tackle Mauao anyway, no matter the rain. The walk up is quite steep but on easy gravel paths all the way up. The Mount is more a hill than a mountain and is 230 meters high. It took a bit more than 30 minutes to walk up and despite the rain the Mount was busy with people eager to burn some calories. There are some really pretty views on the way up already, but the top is really breath-taking. There’s an almost 360° view over Mount Maunganui, Tauranga and the busy port. And it even stopped raining, yay! 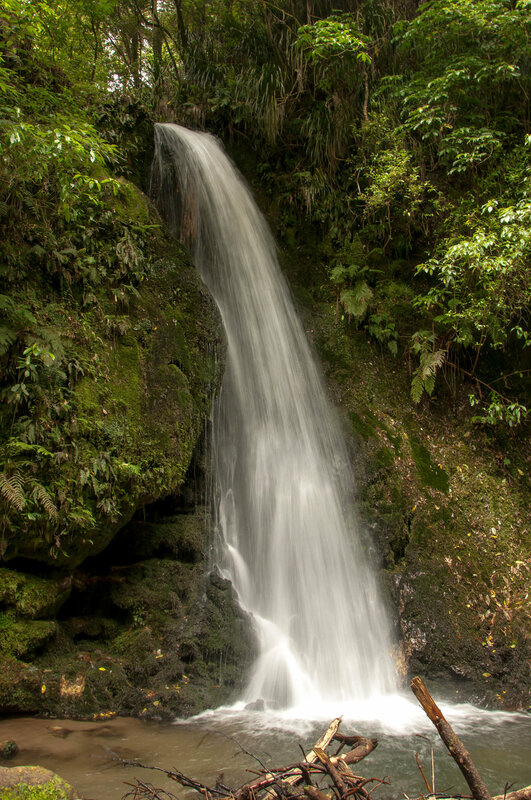 On the way back, we took a slightly different route (as we prefer loops than the same route) that led us past McLaren Falls. It’s a big park with heaps of walking options. The centerpiece is a man-made lake and of course the name-giving McLaren falls. There is kayaking and picnic tables around the lake and a Disc Golf NZ course. 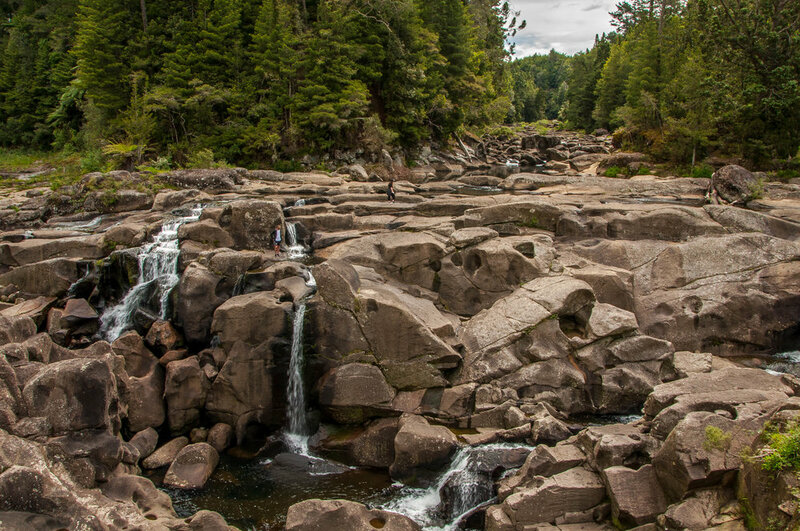 The gorge before the park is also worth discovering. If you like freezing cold water, you can even take a swim or jump off the cliffs. And if you're like me, you'll enjoy hopping from boulder to boulder. On route, we just had to stop at Matamata. It’s the home town of the famous Hobbiton, the area where they filmed the scenes of the Shire in Lord of the Rings. The town itself is all into the movie, so it’s no real surprise that their local I-Site looks like an actual hobbit house. So cute!